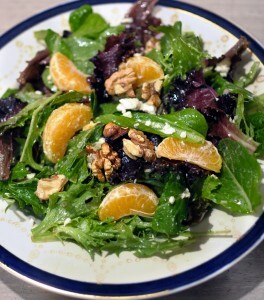 Winter Salads :: Oracibo.com - Food, Travel, Design and Cooking! Meyer lemons were something we never saw in our markets here in Vancouver…but thankfully all that’s changed! Heck, even Costco sells them now! This dressing is excellent and I make it often. Whenever I find Meyer lemons, I pick up a bunch, squeeze them and freeze the juice for later use. 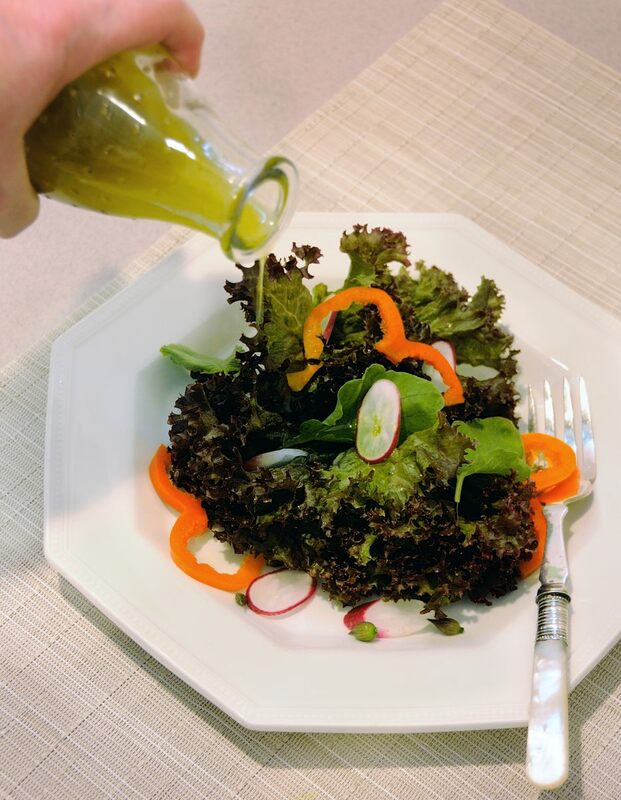 Put everything, except the oil, in the blender & blend until well combined; slowly drizzle in the EVOO until dressing is emulsified or all ingredients are well blended. Taste, adjust seasoning to your taste & enjoy. This one is for all of you who hate anchovies as much as I do! I’ve sampled really fresh, marinated ones in Italy, sorry, they still taste like anchovies! It’s OK though, my husband adores the little morsels! The garlic gives it a really good punch. Anne gave me her recipe a really long time ago and we make the dressing often as you can tell from the stained, well-used recipe in the photo. Get out the romaine, parmesan and homemade croutons. Combine everything but the oil in a blender. Blend well. Slowly drizzle in the oil until well emulsified. Pour into a jar & keep chilled for up to 3 or 4 days. 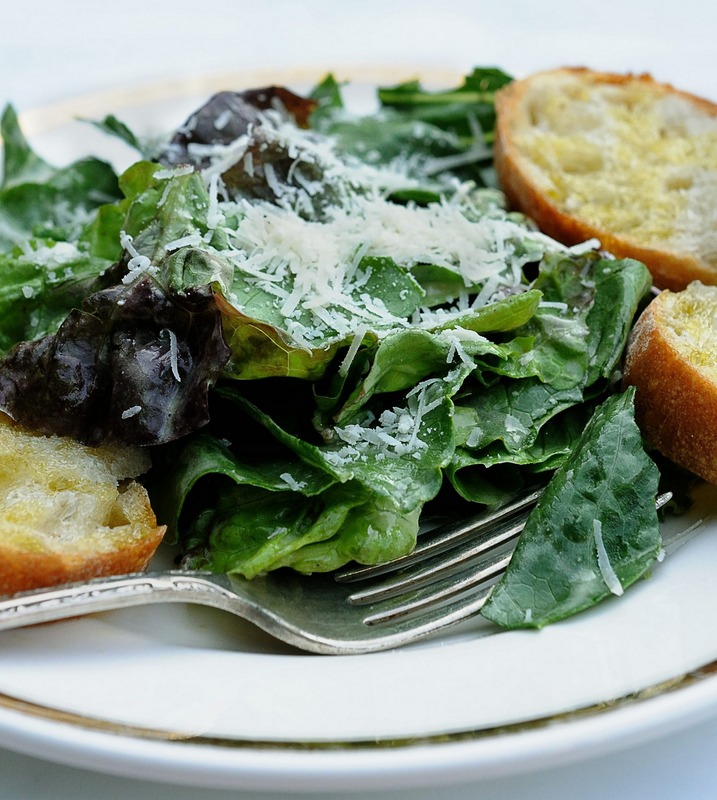 Toss with romaine lettuce leaves, a generous sprinkling of Parmesan cheese & croutons, toss again. Enjoy! If you would like to make your own croutons, please go to Homemade Croutons. 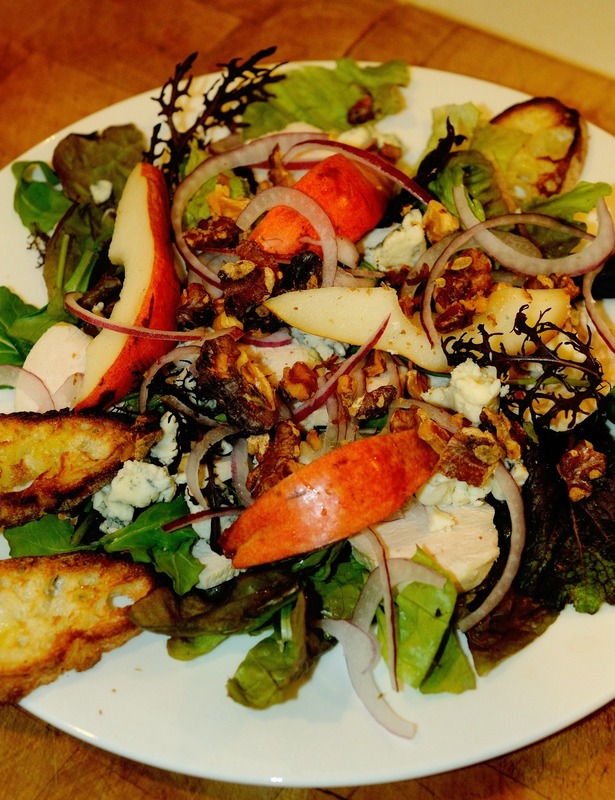 Featured image shows salad with toasted Italian bread drizzled with EVOO…also fabulous! This is my adaptation of the famous salad. I absolutely adore Cobb Salad. From the tang of the blue cheese to the creamy avocado, crunchy lettuce, salty bacon, delicious! Serve with homemade biscuits** or purchased rolls. 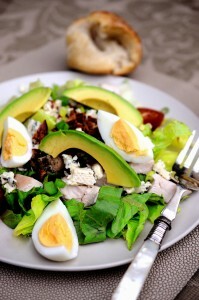 Thinking of starting a “Cobb Salad Club” for everyone I know who loves this salad as much as I do! You may need to increase the dressing if you are making recipe for 6 people. Whisk together all dressing ingredients, except oil, in a bowl, then very slowly whisk in oil in a thin stream, until emulsified. Or you can do this in a food processor. If you like you can make the dressing 1 hour ahead and store in the fridge until needed. Bring 5 cups of water to a simmer in a large saucepan, add chicken & simmer, covered 6 minutes. Remove pan from heat & cover; let stand until chicken is cooked through, about 15 minutes. Transfer chicken to a plate to cool completely. This can be done the day before. (You can use leftover chicken breast if you have any, say from a roast chicken). Cut the chicken into 1/2” cubes. Halve, pit & peel avocados. If you rinse them with cold water, they won’t darken for some time. Cut the avocados into slices. Divide the romaine (& watercress if using) between 4 – 6 dinner plates. Top with the chicken, arrange the avocado slices, egg wedges & cherry tomato halves decoratively around the plate. Sprinkle with the bacon and garnish with chives or green onions. Serve the salad, passing the dressing. If you would like to see how to microwave bacon, click Cooking Bacon in the Microwave. If you would like to make biscuits, click Biscuits. If you only knew how many recipes I have for coleslaw! It’s seems like there’s at least one from every country in the world! This one is great with any Asian inspired meal and would go well with ribs, chicken or pork chops and I think would be a great addition to a barbecue. Just remember to dress the salad just before serving. Whisk dressing ingredients together in a small bowl. Pour into a jar with a lid so you can shake it up when you come to dress the coleslaw. You can make this the day before; just remove the dressing from the fridge 30 minutes before you want to use it. I always make the dressing ahead as I find it helps to blend the flavours. 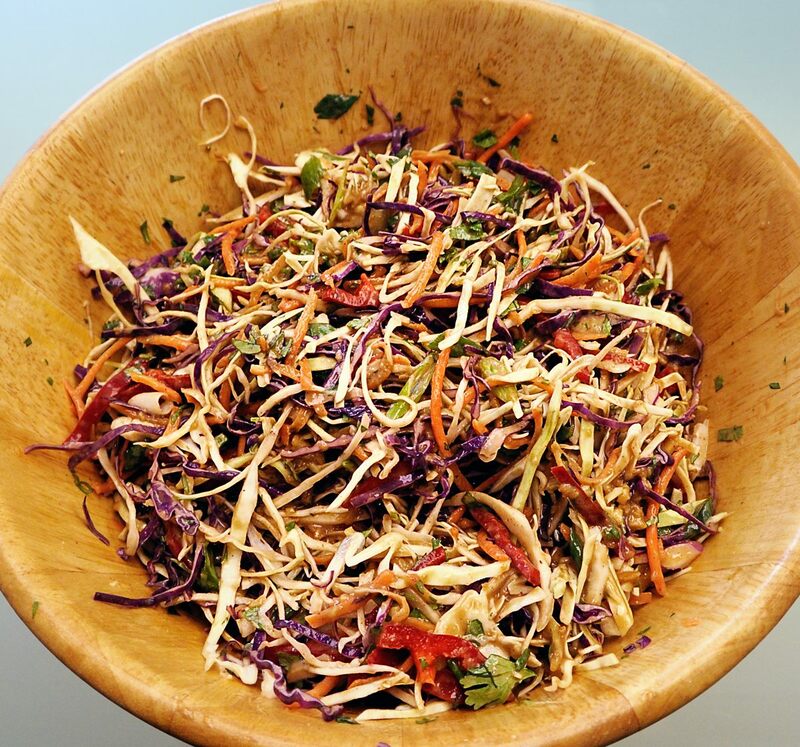 Combine the salad ingredients in a large serving bowl. Add the dressing & toss to coat. Season with salt & pepper & serve. This recipe is in homage to the lady who hired me to take over at the executive dining room of a major Canadian bank, when she retired two years later. This salad was always welcomed at the luncheons there, especially after Christmas and New Year’s pig-outs! It is very refreshing and really good. I particularly like to serve biscuits with this salad. Click on the links at the bottom of the recipe for two of my favourite biscuit recipes. Combine the oil, lemon juice, paprika, sugar & ginger in a jar & shake well. Place the shrimp into a large bowl. Pour half the dressing over & marinate in the fridge for an hour to blend the flavours. In a medium-sized bowl whisk together the remaining dressing, mayonnaise, ketchup, Dijon mustard, Tabasco & white pepper; put aside in the fridge until ready to assemble the salads. Remove the skin from the pineapples; quarter & remove the cores. Cut the pineapple into bite sized cubes. Tear the lettuce into pieces & arrange on individual dinner plates. 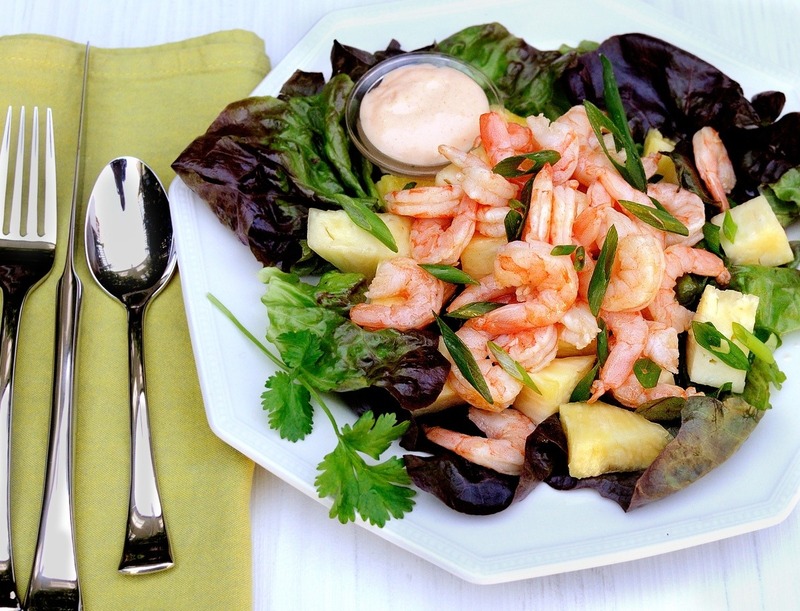 Arrange the pineapple cubes in a mound on top of the lettuce; drain the shrimp & place on top of the pineapple cubes. Either drizzle with the dressing or pass dressing separately. Garnish with cilantro or flat-leaf parsley, green onions & lemon wedges. **I particularly like this salad with Anne’s bran biscuits but my homemade buttermilk biscuits are equally good. 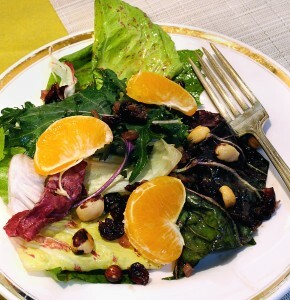 This salad is one that I like to make in December and January when clementines are available. If you find some watercress it would be a nice addition to the other greens. If you have a pear on hand you could chop it up and add it as well. The salad can be served as a main course; maybe with a bit of cooked chicken breast. Whisk together all ingredients except the EVOO in a small bowl; slowly drizzle in the EVOO, whisking constantantly until the dressing is emulsified. Set aside. Mix the salad greens, walnuts, cranberries, red onion slices & clementine segments together. Toss with enough of the dressing to lightly coat the salad. Crumble the goat’s cheese over & toss again. Serve immediately. **If you would like to see how to toast the nuts, please go to Toasting Nuts. An utterly fabulous salad! 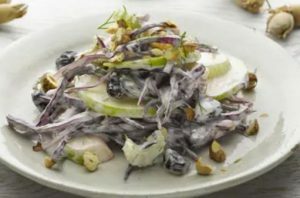 This is a recipe I like play around with and all are wonderful, especially the one with duck cracklings, croutons, Gorgonzola and changing out dried sour cherries for the cranberries in the dressing! The key is the dressing! 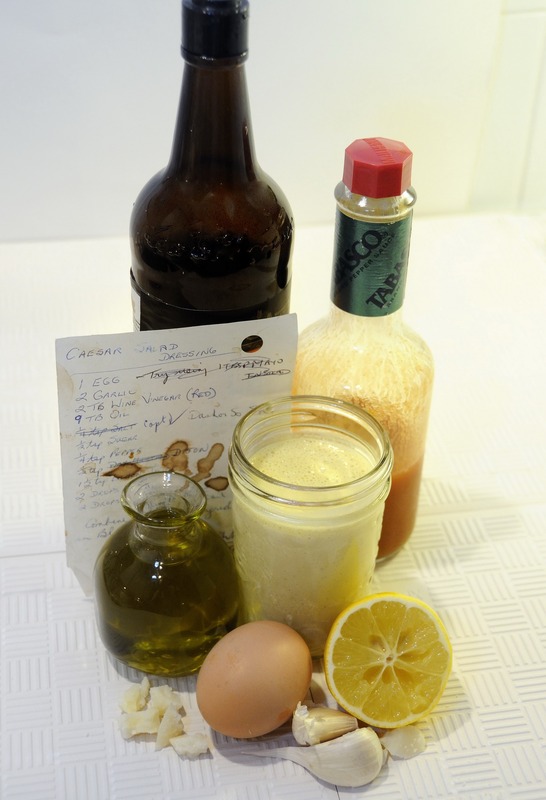 Don’t fret if you don’t have hazelnut oil, use 3 tablespoons EVOO and 1 tablespoon vinegar, it will be great! In a small saucepan heat 2 tsp. EVOO over moderate heat until hot but not smoking & cook shallots, stirring, until golden brown. Stir in the cranberries, 3 Tbsp. vinegar, water, sugar & simmer, stirring occasionally, until syrupy, about 4 minutes. Transfer mixture to a bowl & cool to room temperature. In a small skillet heat 1 tsp. EVOO over moderate heat until hot but not smoking & cook the toasted hazelnuts with salt & pepper to taste, stirring until golden brown, about 3 minutes. Transfer to a plate & cool. In a small bowl whisk together mustard & remaining tablespoon vinegar with salt & freshly ground black pepper to taste. In a stream whisk in 1 Tbsp. hazelnut oil & 2 Tbsp. EVOO (or use 3 Tbsp. EVOO instead), until emulsified. Toss the greens in a large bowl with just enough dressing to coat & divide the greens among 6 plates. Sprinkle with the cranberry mixture & hazelnuts. Variations: I have added crumbled Gorgonzola or bleu cheese to the salad too! During the holidays I like to add fresh mandarin orange sections. And…don’t see why it would not be excellent with leftover turkey & mandarin orange sections to make a main course salad for 3 or 4 people. **If you would like to see how to toast the hazelnuts, please go to Toasting Nuts. I make this dressing so often, I could make it in my sleep! It’s terrific on really fresh salad greens and on a tomato & onion salad topped with shredded fresh basil and chopped fresh oregano. Yummy, yummy! Makes Enough Dressing for 4 – 6 people. Mash the garlic with the salt on a clean surface with a large knife, using back & forth movements of the knife, continually mashing them together until a paste has formed. Place in a medium sized bowl. Add the mayo, vinegar & Dijon. Slowly drizzle in the EVO constantly whisking until emulsified. Season to taste with salt & pepper. Toss the greens with the dressing, sprinkle with croutons & cheese and serve. “South East Asian”: Use 1/2 lime juice & 1/2 white wine vinegar, add a bit of chopped mint or cilantro, change up the canola oil or other vegetable oil for the EVO a bit of cumin. Raspberry Vinaigrette: Substitute raspberry vinegar for the wine vinegar, change the garlic to finely chopped shallot & salt & pepper to taste. **If you would like to make your own croutons, please go to Homemade Croutons.